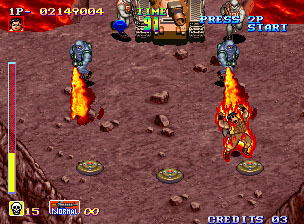 Inexplicably, Shock Troopers remains one of the Neo's best-kept secrets. A game of this quality should be up there with the system's true classics, but somehow it's kept a low profile. 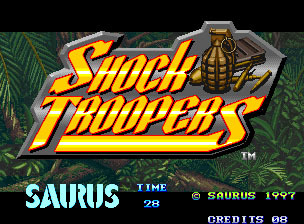 Time to change that--go find Shock Troopers, play it, and tell a friend. This excellent shooter deserves to be celebrated. When the granddaughter of a scientist who can create a drug that will give the terrorist organization known as the Bloody Scorpion Group control over super-soldiers is kidnapped...well, naturally, they call in the Shock Troopers (cue music). And once they repeat the above run-on sentence one more time and a bit more slowly, the eight members head off to take out the BSG either as "Lonely Wolf" operatives (all three lives are one character, like a normal game) or as a three-person team (when you lose one life, one of your other chosen team members steps in, or you can swap them in at will). You'll fight your way through jungle, mountain, or valley terrain to reach BSG HQ (and we know it's their HQ because everything they own is emblazoned with the initials "BSG"), ultimately squaring off against the leader, who bears an...uncanny resemblance to the X-Men's Wolverine. Let's go, bub! 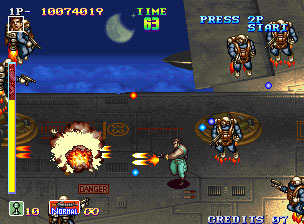 Control is daunting at first--in addition to buttons for guns, bombs, evasion (a nifty roll-out move to avoid attacks) and team member swaps, you can walk in one direction and fire in another, but you don't have the luxury of SNK's old Ikari Warriors rotating joystick knob. This fire-lock technique will become an asset once you learn it, as it enables easy strafing of targets when you're facing a hail of bullets. And you'll face a hail of bullets fairly often--there are tons of enemies in this game, and the fun comes from feeling overwhelmed. Furthermore, you'll earn large point bonuses for close-up kills--risk your neck with a knife attack and there's 30,000 points in it for you. There's plenty of excellent shooter gameplay packed in here, and each level seems to offer a new twist--rock climbing, battling on top of a moving train, sliding down a zip line. The levels are long and varied, with tons of power-ups along the way--you simply can't get bored. Characters are crisp and have personality, even on the small scale. Compared to the sequel, the characters look much more realistic and less cartoony. 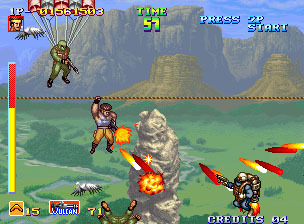 Shock Troopers takes advantage of the Neo's scaling abilities with enemies that jump in from above, as if leaping from helicopters overhead onto the battlefield--an old trick by 1997 but still an oft-used one. All the levels look different from each other, too; there's a minimum of texture sharing, so the Valley path doesn't resemble the Mountain or Jungle routes. Explosions are bright and massive. 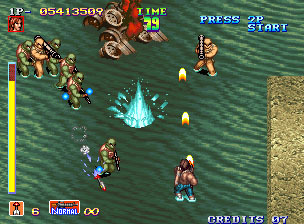 I'm not sure what Japan's fascination with bad 80s-era heavy metal is, but I know that it's strong enough to have infected the soundtrack of Shock Troopers. You'll hear more synthesized rock guitars than you will want to hear. Ditto the weak voice acting--a few generic screams repeated over and over makes for a less than interesting soundtrack. 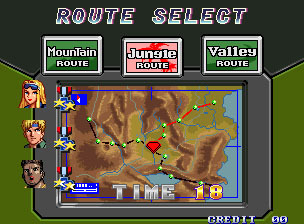 Three distinct pathways means you can take a different route (or a combination of two routes) to the final showdown every time you play, if you want. That gives this a little more replay value than your average character-based shooter. That, and every time you play, you'll want to try to do it on less lives, or with a different characters, since they all have different special weapons. 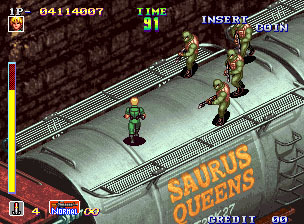 Why isn't this excellent action game mentioned in the same reverent breath as Metal Slug? 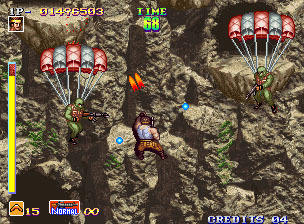 Maybe its art isn't as distinctive, maybe its controls are a little tougher to master, but its shooter frenzy stands up alongside some of the best the Neo has to offer. And since it's MVS only, you'll pay for the privilege of playing it; expect to pay somewhere between $50 and $100 for this cart. If you like shooters, it's well worth the money.